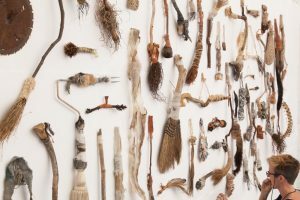 Jody Graham’s work is part of the current exhibition ‘Mythologies of the Discarded’ at the Peacock Gallery. Discover the wealth of materials and inspiration the natural environment has in supply as drawing and painting tools. Participants will make drawing tools from discarded materials found in Auburn Botanical Gardens, then use these tools to create expressive drawings. This workshop will open your eyes to the possibilities the natural environment has to supply material and inspiration to make artworks. Sitting in a making circle we will use found natural objects to make drawing tools, then use these tools to make expressive drawings with ink. These tools will generate authentic natural expressive marks and you will have both drawings and a drawing tool keepsake to take home and reflect on the experience.